Healthcare today is no longer what it used to be a decade ago. Things are changing at a rapid pace making it easier to avail better healthcare service at an affordable price. It has involved the patient in her own healthcare in a big way, as healthcare industry believes patient engagement will lead to better health management. 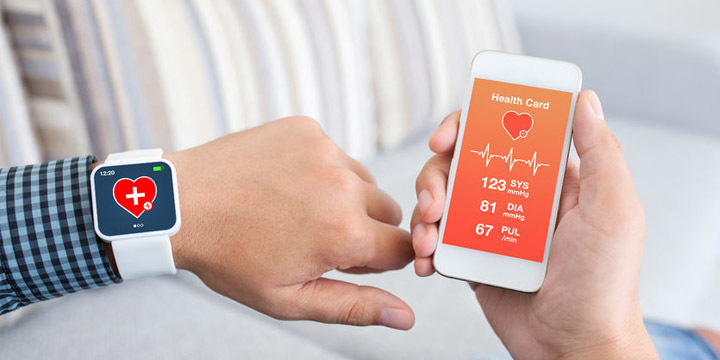 To facilitate this, there are various wearable healthcare devices that are paving the way for better health management. Innovations in artificial intelligence, Cloud computing and analytics will determine the future of Health IT. The whole system is focused on making treatment an error free process making it easier to access medical records and parameter values. It is also cheaper than manual health record management while taking the physician patient engagement to the next level. Wearable devices have revolutionized healthcare. These devices are worn close to the body, on the body or even in the body. Miniaturisation, enhanced connectivity, improved usability, reduced cost, increased reliability and battery life have already made these wearables very popular. Today, the smartphone that almost everyone carries for communication has become the primary device for recording, assessing and communicating healthcare information. More than 300 companies are completely devoted to digital health. Some of the popular ones help measure core health data like body temperature, blood pressure, vision quality etc. Omron wristband: This wrist-worn health wearable is a subtle and clinically accurate blood pressure monitor (BPM) that provides real-time blood pressure readings. This device will help patients with chronic illness better record and manage their health data. The wristband also collects data like number of steps taken, calories burned, and sleep quality, to give patients a better image of their health. Resound: This iPhone app will help users control their hearing. This application has smart hearing aids and accessories for people with mild to severe hearing loss. RightEye: RightEye is a goggle that uses eye tracking and gaming stimuli to measure vision performance. It will help in assessing eyesight and detect concussions and performance problems. This goggle will help evaluate visual skills and vision health. Gymwatch: This wearable will help top track speed and form during body weight exercises. It detects the range of motion and strength used during exercise, and offers real-time feedback on your form. Hexoskin: This product is not a device but smart clothing that will measure heart rate, pace, breathing rate and volume, steps taken, calories burned, and sleep. These biometric shirts have sensors woven into the fabric. All the recorded data will be transmitted to an iOS or an Android phone. iHealth Rhythm: This is a smart electrocardiogram that records heart activity and saves data to an iOS app. The Rhythm is subtle and worn under clothing. A flat recording device clips to a three-electrode patch worn on the sternum to measure cardiac activity. Zhor: Zhor has built smart footwear called DigitSole, which helps to measure the number of steps taken and calories burned. It also helps to keep the feet warm. This smart sole can be adjusted according to the size of the foot. LumniWave: This is a wearable that provides infrared light therapy for people suffering from or experiencing unceasing pain. The infrared light penetrates tissue and causes the body to release natural pain relief. Thermo: This is a smart temporal thermometer that records accurate body temperatures. It contains 16 sensors and HotSpot sensor technology and uses WiFi to sync temperature and advice to a compatible mobile app.